Or view larger version. 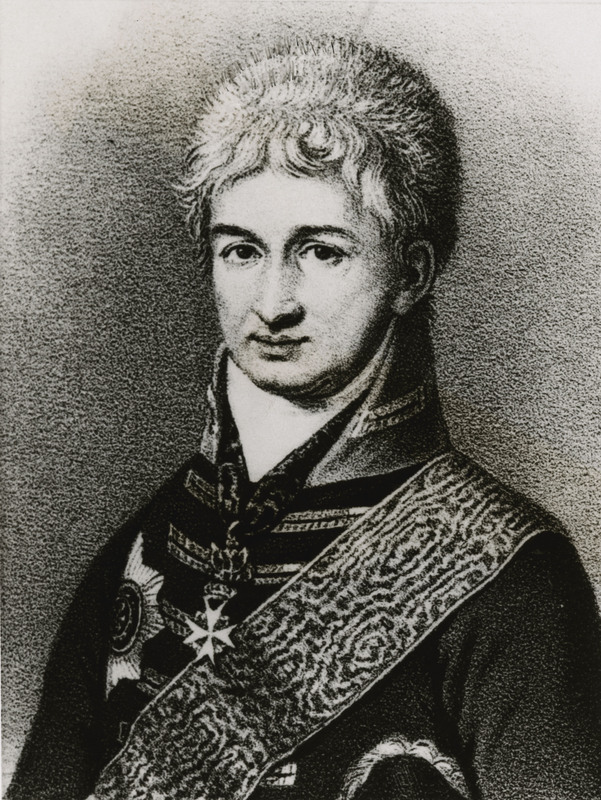 Nikolai Petrovich Rezanov. Date unknown. Unknown artist. Photograph of an engraving. Collection of Oakland Museum of California. The Oakland Tribune Collection. Gift of Alameda Newspaper Group. This is a portrait of Nikolai Petrovich Rezanov, a Russian nobleman and one of the founders of the Russian American Company. The Russian American Company engaged in the fur trade off the northwest coast of North America. While managing the Russian American Company, Rezanov undertook a trade mission to the Spanish settlements in California to establish a formal means of procuring food supplies in exchange for Russian goods. After his return from San Francisco presidio, Rezanov recommended a presence be established north of San Francisco Bay. This settlement would become Fort Ross.